The most frustrating aspects of the media coverage of the current efforts to suppress the forces of Daesh (ISIS) in Iraq and Syria is that there is a dearth of ‘joined-up’ thinking behind most of the analyses. There is a lot of eyewitness reporting of daily events in the countries, cities bombed, planes downed, tactical struggles for control of cities and provinces, secret alliances and nefarious activities , as well as a litany of opportunism by politicians pressing self-serving analyses of the events. The most important problem, however, is that each aspect of the evaluation of the impact of the Syrian crisis is treated as a discrete problem, unrelated in any meaningful sense to the bigger picture. There is probably no better example than the world’s reaction to events in Turkey and the search for a solution to the current crisis over Syria and its attendant problems. Turkey is the key to the Syrian crisis and its unique geographic, political, ethnic and military situations are the most important antecedent problems facing the world when trying to adopt a useful and credible policy for dealing with Syria. Turkey has played, and continues to play, a duplicitous role in relation to Syria, and so it has found itself in conflict with enemies both international and domestic. It is bitterly opposed to the Assad regime but hates and attacks the Kurds even more, despite the fact that the Kurds have been doing much of the heavy lifting in the battles against Daesh. Turkey has supported Daesh in Syria; funded and supplied Al-Nusrah; attacked and bombed the Kurds to the south and east of the frontier; made a market in Syrian oil; refused (until recently) for the U.S. to use the Incirlik Air base; attacked and downed a Russian plane passing through Turkish air space for 17 seconds. Turkey’s National Intelligence Organization (Millî İstihbarat Teşkilatı,MIT) has been the main supplier of explosives, ammunition, medicine, and free passage to Daesh fighters inside and alongside Turkey. So why does Turkey have a universal “Get Out of Jail Free” card from the international community? Some of the reasons are geographic. Turkey occupies a territory in the centre of the links between Europe and Asia; between the nations of the Arabian and Gulf heartland and the Iraqis and Iranians; and, most crucially, Turkey controls the water supply of the Euphrates-Tigris River Basin. 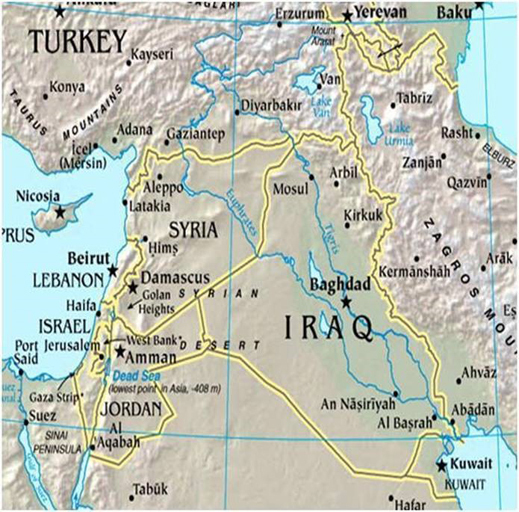 Agreements between these countries date back to 1926, with the Good Neighbourliness Agreement between Turkey and French Syria, outlining Syria’s water rights; and the Treaty of Friendship and Neighbourly Relations between Turkey and Iraq, under which Turkey agreed not to change the flow of the Euphrates River or construct waterworks without first consulting Iraq. 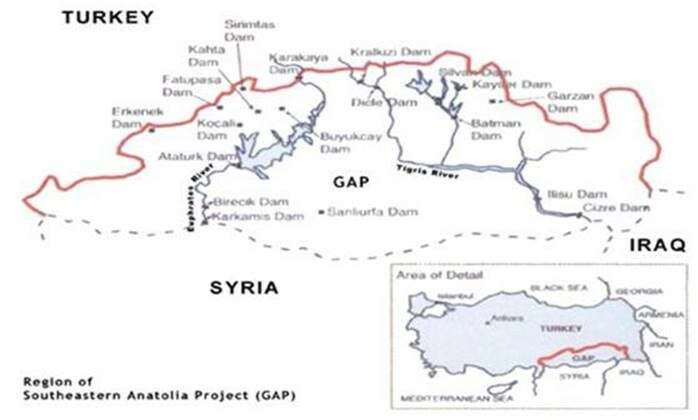 In the 1960s, Turkey, Syria and Iraq negotiated a new phase of their relationship over water, as a result of Turkey’s decision to construct the Keban Dam on the Euphrates. After prolonged negotiations, Turkey guaranteed to maintain a discharge of 350 m3/s immediately downstream from the dam, provided that the natural flow of the river was adequate to supply this discharge. This was communicated to Syria and Iraq the same year. Moreover, during their meeting, Turkey proposed the establishment of a Joint Technical Committee (JTC), which would inspect each river to determine its average yearly discharge. In 1965, the three nations met again to exchange technical data on the Haditha (Iraq), Tabqa (Syria) and Keban (Turkey) dams being built on the Euphrates. There were several small procedural agreements over the next few years. But there was no overall agreement on the ownership and use of the water. In 1987 the Turks and the Syrians made an interim protocol on the waters of the Euphrates as Turkey was filling its Ataturk dam. A further protocol was arranged in the Water Allocation Agreement between Syria and Iraq: this was the Protocol of 1989. It has regulated how much of the water Turkey permitted to flow into Syria would be allowed by Syria to pass on to Iraq. The fundamental problem in this division of the waters of the Tigris and Euphrates is that the levels of water have been gradually diminishing and water shortages are an ever-growing problem for Syria and Iraq. ** Since 1975, Turkey’s extensive dam and hydropower construction has reportedly reduced water flows into Iraq and Syria by approximately 80 per cent and 40 per cent respectively. Approximately 90 per cent of the water flow in the Euphrates and 50 per cent in the Tigris originate in Turkey. This has left Syria and Iraq vulnerable. This situation was made critical with the rise of the Daesh basin. The ongoing spread of Daesh across the region has ended up with “non-state actors” seizing control of water resources in Syria and Iraq. Daesh is able to use water structures as a means to prevent Baghdad and the Shiite population inhabiting the southern part of Iraq from accessing water. Lack of water has a negative impact on agricultural production and energy generation. Water scarcity leads to migration from the region and the breakdown of the authority and policy influence of the riparian countries. However, Daesh in northern Syria and near Mosul in Iraq are also dependent on water flows from Turkey. This means there is a limited amount of pressure that either Iraq or Syria — Daesh as well — can apply to Turkey without risking a severe shortage of water. A second advantage for Turkey as a result of its geography is that it has control of the Straits of the Dardanelles and the Bosporus. Access for shipping to and from the Black Sea depends on Turkey and the Turkish Navy at the chokepoints of the Bosporus and the Straits of the Dardanelles, both parts of Turkey. The question of freedom of access to the Black Sea was settled in the Montreux Convention Regarding the Control of the Straits when it was signed on 29 July 1936. This revised the penalty the Ottoman empire had suffered from losing World War I – that was the 1923 Treaty of Lausanne formalizing Turkey’s new borders, demilitarizing the straits, and placing shipping under an international commission. The Montreux pact is a recognised international agreement; registered in the League of Nations Treaty Series on 11 December 1936. It regulates the transit of naval warships. The Convention gives Turkey full control over the Straits and guarantees the free passage of civilian vessels in peacetime. However, it also restricts the passage of naval ships not belonging to Black Sea states. The terms of the convention have been the source of controversy over the years, especially over the efforts of the Soviet Navy sailing to the Mediterranean through the Straits. Without the permission of Turkey Russian warships are not allowed to pass freely through the Straits. The Convention provided authority for Turkey to close the Straits to all foreign warships in wartime, or when Turkey believed itself threatened. Additionally, it was authorised to refuse transit from merchant ships belonging to countries at war with Turkey. Non-Black Sea state warships in the Straits must be less than 15,000 tonnes. No more than nine non-Black Sea state warships, with a total aggregate tonnage of no more than 30,000 tonnes, may pass at any one time; they are permitted to stay in the Black Sea for no longer than twenty-one days. Erdogan thinks he has a big “Get Out Of Jail Free” card with Russia as a result of the Montreux treaty. When Russia imposes sanctions on Turkey for its downing of a Russian plane, Turkey thinks there are limits on Russia’s ability to retaliate. The calculation in Ankara – in Washington, too – is that if Turkey claims there is an “imminent danger of war” (Montreux Treaty, Articles 20- 21) from Russia, Turkey may cut off access for the Russians to the Mediterranean Sea, making resupply of Russian forces in Syria much longer and costlier. The Turks think this an area of concern to Russia. The Russians have traditionally viewed such Turkish threats to amount to a cause of war. In this case, world war. The Montreux Convention does not grant Turkey unilateral authority to decide when there is “an imminent danger of war”. Instead, it grants the European states and the United Nations Security Council the power to overrule the Turks. According to the online vessel tracking system marinetraffic.com, following the November 24 shoot-down of the Su-24 by the Turkish Air Force, a number of Russian vessels were delayed in the southern approaches to the Straits while waiting for Turkish permission for passage northwards into the Black Sea. Tracking of other countries’ ships reportedly did not show similar delays. 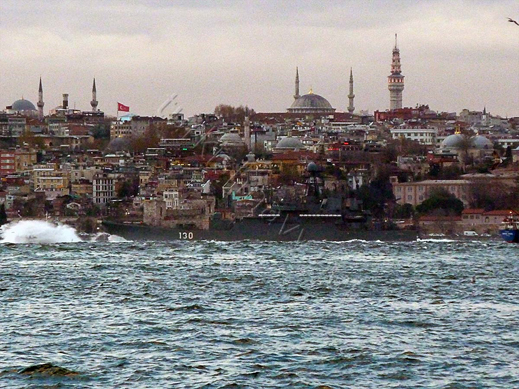 The Russian vessels appear to have resumed normal passage through the Bosporus on November 28. One vessel, the Bratsk, was reportedly held up for 9 hours; the Volgobalt for 14 hours. US media have reported the shipping delays as a shot across the Russian bows by the Turks. Russian reports have dismissed the shipping reports as media bluff. The Saratov, a Russian Navy landing ship of the Alligator class, proceeding northwards through the Straits on November 21, according to Bosphorus Naval News, a Turkish publication. The Korolev, a Ropucha III class landing ship, heading northwards in the Bosporus on November 28, also recorded by Turkishnavy.net. Confronted by the North Atlantic Treaty Article Five which states that an attack on one ally shall be considered an attack on all allies, the calculation in Ankara and Washington is that it is unlikely Moscow would undertake serious military action against Turkey without risking a wider, more lethal confrontation. Turkey is relying on Article Five as its first line of defence. On the other hand, there are signs that among the European allies of NATO there is no support for Turkish confrontation tactics or provocation of Russia in the Straits. Article Five leaves to each of the member states to “assist” and take “such action as it deems necessary”. There is no German or French support for going to war on behalf of Turkey. The Turks have yet another “Get Out of Jail Free” card in dealing with the European refugee problem. There are millions of refugees escaping Syria from the Syrian civil war. Many have passed into and through Turkey, and have joined the columns of refugees following Chancellor Angela Merkel’s offer of welcome in Germany. The proportions of the refugee movement have overwhelmed Europe’s capacity to absorb them. So, in spite of their antipathy towards Turkey and their refusal to allow Turkey to join the European Union, the Europeans have agreed to swallow their distaste for Turkey’s abuses of its citizens, its press, its Kurds, and its political institutions, and agreed to a three billion Euro bribe to Turkey to block the flow of refugees. In addition, Turks will get accelerated visa travel in Europe and renewed consideration of Turkey’s application to become a member of the European Union. The Turks have now turned back thousands of refugees and abandoned them to an uncertain fate. The Turks have discovered that they have a “Get Out Of Jail Free” card to use with the U.S. as well. When the U.S. was pulling out of Afghanistan it needed to move men and machinery out of theatre and back home. Troubles in Pakistan made movements through that country impractical. Largely unnoticed by the public, the U.S. military has arranged with the Russians the ‘Northern Distribution Network (NDN)’. In fact, the NDN comprised several itineraries, commencing at one of two western hubs in Latvia and Georgia. From these secure jumping-off points, the cargo goes by combinations of trains, trucks and ferries across Russian territory and the adjacent ex-Soviet ‘stans’ to enter Afghanistan from the north. 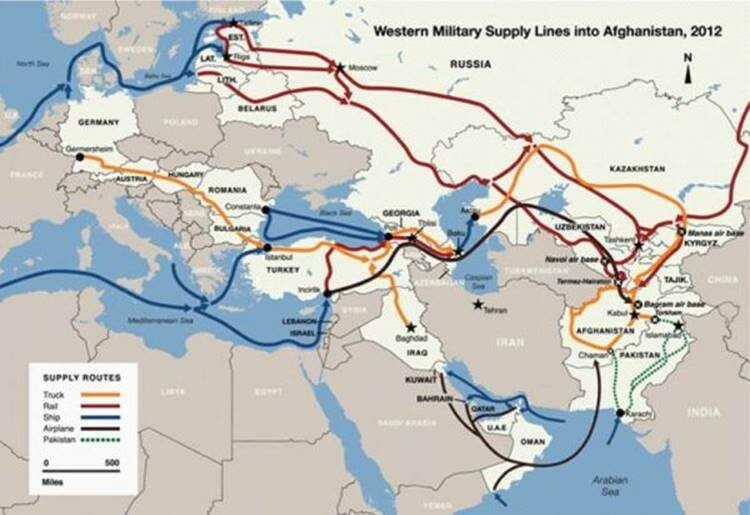 All of the new routes share the same attraction of avoiding Pakistan. Taken together, these new routes in the NDN provided multiple paths for overland supplies that, however expensively, make it logistically sustainable for the U.S. and its allies to wage their Afghan campaign and to end this campaign by bring home the men and equipment. The key precondition for this collaboration between the U.S. and Russia was that Turkey refused to allow the U.S. to fly to Incirlik or other bases in Turkey to bring Afghan materiel home. That refusal has now ended. It was not until August 2015 that Turkey agreed to allow the U.S. return to Incirlik to conduct its bombing of Daesh in Iraq and Syria. On the first day the U.S. flew missions from Incirlik, the Turks used the opportunity for their attack on Kurdish bases in Iraq and Turkey. This unilaterally ended the Washington accords which had created a ceasefire in the Turkish-Kurd fighting. The Turks know how important it is for the U.S. to maintain its presence at Incirlik. The U.S. thinks that because Washington is relying on Turkey now, this will inhibit its desire to attack the Kurds. The Turks have played a major part in the radicalisation of Islam in Central Asia. For over a decade Turkish imams, sponsored by Saudi Wahhabi money, have been running radical madrassas throughout Central Asia (Turkmenistan, Kazakhstan, Uzbekistan and the Caucasus). They have been training the young students of the area; at the same time Turkish trucking has dominated commerce in the region, often providing the trucks for smuggling oil out and weapons in. The Justice and Development Party (AKP) in Turkey has been generous in providing support for these madrassas at home and in the region. The current Turkish President, Recep Tayyip Erdogan, was the AKP president. The current Prime Minister, Ahmet Davutoğlu, leads the AKP majority in parliament. What the U.S. is most interested in is supporting the Kurdish fighters in Iraq and Syria. In that effort it has been bitterly opposed by the Turks. What the Turks have been demanding from NATO is the creation of a “safe zone” which will stop the Kurds from capturing the territory in Northern Syria and from joining this territory with the cantons that have already been united by the Kurdish People’s Defence Units (YPG). If the YPG succeed in creating a region which they dominate across the whole of Northern Syria they will prevent the Turks from continuing to provide aid, arms and assistance to their clients in Syria, both Al-Nusra and Daesh. It is important to note that the Turkish-supported Turkmen Syrians who occupy the region have been preventing the Kurdish YPG forces (supported by the U.S.) from joining up and sealing the Syria’s northern frontier. This has made the Turkmen militia targets also of the Russian bombing campaign. So far the U.S. has been quiet about this development as it has effectively ended any Turkish hope of a “Safe Zone” on the border. So, from the outside it seems as if the Erdogan government is able to play off all its foes with a wide range of disincentives. What it cannot do is control what is happening inside Turkey and in Turkish politics. While the AKP did better in the November re-election the handwriting is on the wall that many of the AKP opponents are joining together to prepare for its downfall. Turkish labour is mobilised by the continuous attack on its rights. Journalists are jailed. Lawyers are shot or imprisoned. The MIT (intelligence service) may be in the hands of the AKP but the Army is preparing for a comeback. A large part of the Turkish military does not support Erdogan or the AKP. The AKP rose to power on the basis of a plan to keep the military from ever taking power again in Turkey. At a trial in 2012 a Turkish court convicted 326 military officers, including the former air force and navy chiefs, of plotting to overthrow the nation’s Islamic-based government in 2003, in a case that has helped curtail the military’s hold on politics (known as ‘Sledgehammer’ or ‘Bolyuz’). A panel of three judges sentenced former air force chief Ibrahim Firtina, former navy chief Ozden Ornek and former army commander Cetin Dogan to life imprisonment, but later reduced the sentence to a 20-year jail term because the plot had been unsuccessful. The court also convicted 323 other active or retired officers, including a former general elected to Parliament of involvement in the conspiracy, sentencing some to as much as 18 years in prison. Thirty-six were acquitted, while the case against three other defendants was postponed. It wasn’t only the military which was repressed by the AKP. More than 400 other people – including journalists, academics, politicians, trades unionists and soldiers – faced trial on charges of involvement in a conspiracy by an alleged gang of secular nationalists called “Ergenekon.” Begun in 2007, the Ergenekon proceeding ended in 2013 with the former head of the Turkish military, General Ilker Basbug, ordered to serve life in prison. Basbug, who had served as Chief of General Staff under Erdogan, was arrested in 2012, accused of heading the Ergenekon plot against the AKP leader. Similar punishments were decreed for 18 more of Basbug’s former subordinates or colleagues. Hursit Tolon, former First Army commander, was sentenced to life in prison on the same charge as Basbug. Former General Staff Second Chief, General Hasan Igsiz, was also consigned to a life sentence. Retired General Nusret Tasdeler and Retired Colonel Fuat Selvi were similarly sentenced to life in prison. Former Gendarmerie Forces (National Police) Commander Sener Eruygur received an “aggravated life sentence” – a punishment reserved for terrorism cases, in solitary confinement, with limited exercise time, contact with other prisoners or by telephone with family, and no opportunity for parole. Retired general Veli Kucuk saw a double-aggravated life sentence imposed on him, plus 99 years and a month. An array of 33 indictments was consolidated under the Ergenekon rubric in 2011. The list of defendants is as varied as it is long; the single feature uniting them, however, is association with secular politics. 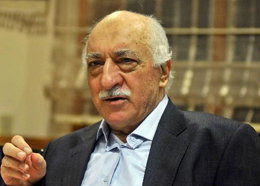 In May 2014 the AKP went after the police force which Erdogan said was full of “Gulenists”, followers of his former ally Fethullah Gulen (right — now living in the US). It purged hundreds of Gulenists from the police, army and the civil service. Turkey is frequently worried about the “Deep State” (derin devlet). This is a group of influential anti-democratic coalitions within the political system, composed of high-level elements within the intelligence services (domestic and foreign), Turkish military, security, judiciary, and mafia, who are engaged in a fight against democracy, social justice and Kurds. These networks were supposedly formed during the Cold War to fight subversive communist agitators within Turkey. However, they were also thought to have been used against the Kurdish insurgency that gripped the south-east of Turkey during the 1980s and 1990s. The battle for Turkey goes on but, as far as its external foes are concerned, the “Get Out of Jail Free” cards still work, though the world’s patience is running out for Erdogan.